While I’ve often seen yoga teachers offer stretches and pose variations for tight hamstrings, tight calves don’t generally get the same degree of attention in yoga class. However, if you have chronically tight calves—as I do—you may well find some yoga poses quite challenging. For example, garland pose, or squat (malasana), is a common nemesis of mine. In order to get my heels to the floor, I have to bring my feet so wide that I wind up looking like a catcher behind home plate when the bases are loaded. Getting my heels to the floor in downward facing dog is another challenge. Unless I shorten my stance to something resembling uttanasana, my heels will probably never reach the earth in this pose. Granted, getting the heels to the floor in downward facing dog is not essential, but I’d love, just once, to see what it feels like! And then there’s warrior I (virabhadrasana I), in which the back foot is ideally turned in at a 45- to 60-degree angle, so that the toes point forward-ish. However, when I attempt to turn my back foot forward, my heel inevitably pops off the mat. If I want to keep my heel planted, I can do so only by angling my back foot forward to such a small degree that the pose begins to resemble warrior II (virabhadrasana II)—a pose in which the back foot is nearly parallel to the back edge of the mat. This isn’t ideal, because changing the position of the back foot affects the position of the hips, which can compromise the purpose of the pose. 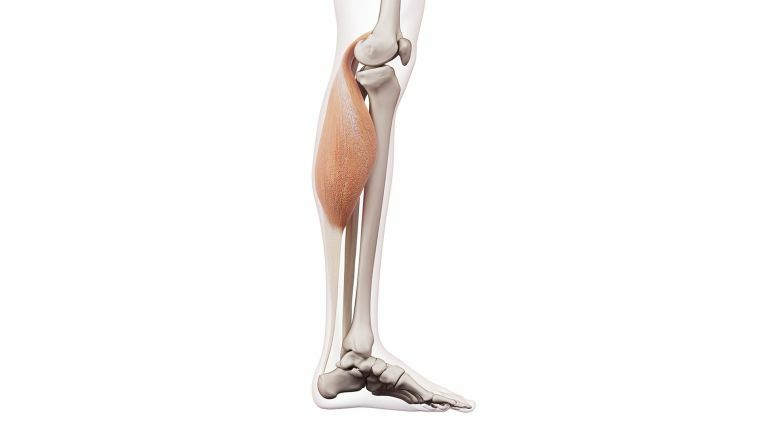 Our calf muscles include the gastrocnemius and soleus muscles—the two large muscles of the posterior lower leg, which insert into the heel bone via the Achilles tendon. The ability of the Achilles tendon to recoil and rebound (literally, the “spring” in our step) is essential for walking and running. However, any tightness in the gastrocnemius or soleus will be transferred through the Achilles tendon, limiting the flexion at the ankle. This tightness may impede your ability to deeply bend the knee while keeping the heel rooted (such as in a squat). But never fear, my fellow tight-calved yogis! Here are a few tips and tricks that can help those of us with even the tightest calves to navigate these poses with ease. Yoga wedges, chip foam blocks, or rolled-up towels and blankets will become your best friends if you’ve got tight calves. When I descend into a squat, my heels naturally want to lift. By inserting one of these handy little props under my heels, I can anchor my heels and become more stable. Try a using a wedge (or similar prop) in poses such as squat, pashasana (noose pose), and warrior I. By providing lift and support for the heels, these props decrease how much the ankles have to flex (and therefore how much the Achilles has to stretch). However, the calf stretch is a useful part of these poses for us, so make sure that you don’t over-prop and miss that benefit. Alternate between using a wedge and going without to assess your progress. While yoga is full of great poses for stretching the calves, you may be unconsciously avoiding some opportunities. In forward folds such as paschimottanasana and janu sirsasana, make sure to completely flex your feet. Placing a hard block against the soles of your feet can help you maximize your stretch. You can also place the soles of your feet against a wall, focusing on pressing your heels into the wall to lengthen the backs of your calves. In poses such as pyramid (parsvottanasana) and half splits (ardha hanumanasana), flex your front foot, pulling your toes toward your shin. Propping the ball of your front foot up on a block (keeping the heel on the floor) can help intensify the calf stretch by adding resistance to the foot flexion. If you feel the stretch only in your hamstrings, bend your front knee until you feel the calf stretch as well. Place your hands on the wall and offset your feet (one foot closer to the wall, one foot back). Straighten your back leg to stretch that calf. Once you’ve stretched in this position for about a minute, add a slight bend to your back knee. Because the gastrocnemius is attached above the knee, bending the knee “slackens” the muscle and moves the stretch into the soleus. Does one muscle feel tighter? Knowing which muscle is tighter can help you target the stretch where it is needed. Also, take the opportunity to stretch out your calves off the mat! Walking up a flight of stairs is the perfect opportunity to pause, drop your heel off the edge of a step, and take five deep breaths. Remember: Keeping your leg straight will target the gastrocnemius, while bending the knee will focus on the soleus. Myofascial release is often used to temporarily increase joint mobility. 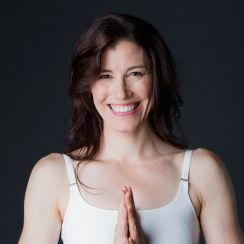 Place a rolled-up yoga mat, a rolled-up towel, or a wooden dowel between your thighs and calves and sit in hero’s pose (virasana) or thunderbolt pose (vajrasana). If the sensation is too intense, place a block or two under your sitting bones to ease the pressure. Start with the prop closer to the knee. Stay and sink into the sensation for a few breaths, then lift up and move the prop down the leg a few inches. Stay and sink into the sensation again for a few breaths. Be careful not to place your prop too close to the knee or ankle joint—the intention of the exercise is to keep the pressure on the belly of the muscles. Warrior I is the nemesis of tight-calved yogis everywhere! For optimal hip alignment, the back foot is usually turned in so that the toes face the front corner of the mat on the same side (i.e., the back left foot points toward the front left corner of the mat). Add a yoga wedge or chip foam block under the heel (see point number one). Widen your stance (if your right foot is forward, move it a little more to the right); this will change the angle of stretch on the back calf. Shorten your stance (move your back foot closer to your front foot), which will decrease the flexion needed in the back ankle and thus alleviate some tension in the calf. Bend your front knee less, which will decrease the flexion needed for the back ankle. Turn your back foot out more, which will decrease the amount of ankle flexion required. However, be careful not to overdo it. Turning out the foot is a result of externally rotating the femur, which will limit your ability to square your hips. Use a wall. Place your back heel slightly up the wall: This is a similar strategy to using a yoga wedge, except that the wall is providing the anchoring surface rather than the wedge. Explore these modifications in other “calf-challenged” poses as well, such as downward facing dog, pyramid pose, and revolved triangle (parivrtta trikonasana). Just as people have different arm and leg lengths, they also have different joint shapes and ranges of motion. Restriction in ankle flexion (pulling the toes toward the shin) may be due to the shape of the ankle joint rather than muscular limitation. 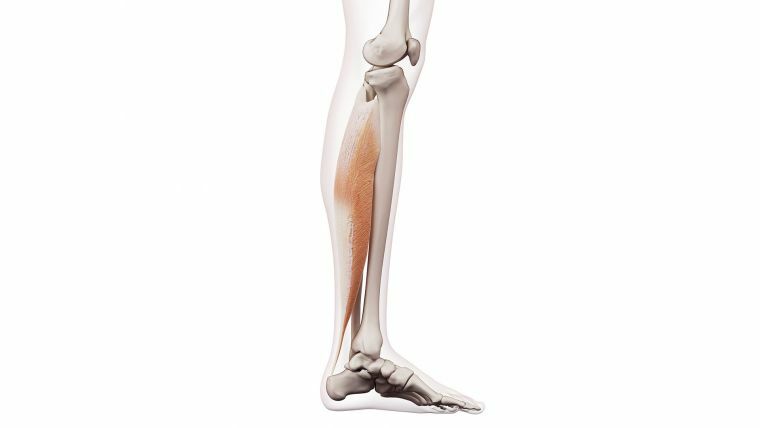 If this is the case for you, you will probably not feel a stretch in your calf, but rather a pinching sensation at the front of the ankle. Remember, asana is never a one-size-fits-all because we naturally have different ranges of motions. Our individual modifications will be unique. As you play with these variations, notice where you feel the sensation in your legs. Happy exploring!